Are you part of a small-to medium-sized organization looking for computer support in Newark? Busy organizations often have complex computer support needs that require the attention of experienced IT professionals. The good news is that Integrated Computer Services, Inc. offers all these types of computer support to Newark organizations. 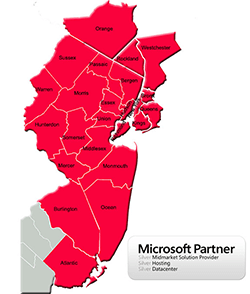 Based in Glen Rock, NJ, we specialize in IT consulting and network support for businesses with 10 to 1000 employees. We have been in business for more than 15 years, and serves SMB organizations throughout New Jersey. Whether you are part of a startup, boutique organization, or established mid-size business, we have customized computer support solutions for our Newark clients. Network Installation and Management: Our comprehensive installation and management services enable computer-support clients in Newark to focus only on starting, building, and running their organizations, rather than wasting valuable time stressing over technology issues. Managed Cloud-Based Backup: With our managed backup services, our computer support clients in Newark don't have to worry about physical servers going down and causing data loss or work stoppage. That's because rather than sending backups to a tape drive or other media attached to the computer, our managed cloud-based backup sends company data securely over the Internet to our backup servers, which are located in a secure offsite location. Cloud Computing Services: With our cloud computing services, we can elevate your business by utilizing the cloud for tighter security and better system availability. Cloud Computing Services enable our computer support clients in Newark to save on hardware and maintenance expenses while enhancing system capabilities and reducing down-time. Network and Data Security: Focus on your strategic business objectives, not on worrying about whether your data is secure. Our services are custom tailored to ensure that all business-critical data is protected from ransomware, data theft, natural disasters, hardware failures, human error, software corruption and more. Disaster Recovery & Business Continuation Planning: Natural disasters only make up 3% of the cases of catastrophic data loss to businesses. The other 97% of disasters are caused by hardware\software failures. Our complete suite of services not only help to keep your network running smoothly, but also enable you to get back up and running quickly following any kind of disaster. Virtual CIO Services: Our virtual CIO services enable us to take a seat at your decision-making table, where we can offer our expert input on IT-related decisions that will have a reverberating impact on your entire organization. Not only does it help your organization make better decisions, it also helps us better understand your business' value proposition and future plans so that we can provide more valuable overall service and support. The above services are just a sampling of our comprehensive computer support services for Newark businesses. Give us a call today to learn how we can provide an entire suite of integral IT support to your Newark organization, freeing you and your team to focus on your business objectives.